Wow! Great Christmas gift!! Let's hope a) it is a 4 door (babies are hard to get into 2 seaters!) and b) you get a great birthday present in return! Wow! Sweet ride! We've been discussing car purchases for baby too, but I think we're going to wait until after tax season when we hopefully have a little extra cash. Awesome - congratulations on the big purchase! Merry Christmas and thanks for your wonderful blog. That cartoon is too funny! I had the same thought. KB better not buy me a car without me knowing it! My dream is that I get one of those cars with a big ole bow someday. What a fun photo op! J is totally leaving me for you. Tacos and new car? Yeah, I don't stand a chance. But, it's OK because ya know, I have Hugh as a backup. He's obviously waiting for me back in NYC. DUH. That is a very sweet thing to do. 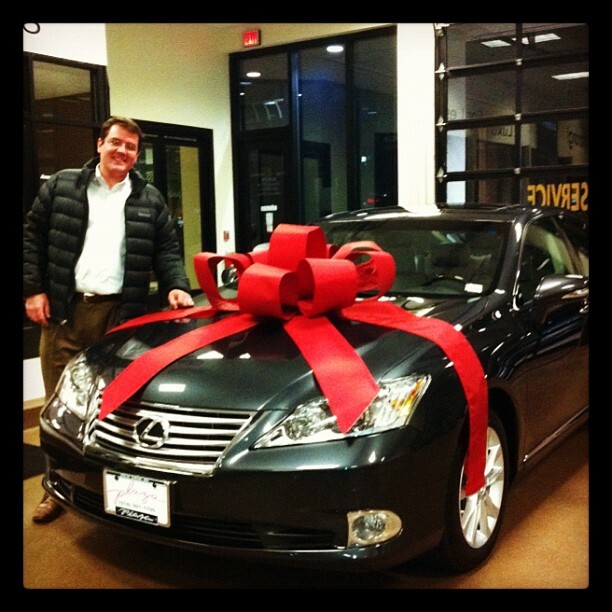 A Lexus is indeed a very nice present. Who doesn’t want a luxury car as a gift? Apart from you, I knew someone who did this too. I’d say that commercial was a success. They made many people actually do it. Congratulations on your awesome car!